EYE SPY: AN ART EXHIBITION FOR KIDS! Come along to this exhibition to play the age-old children’s game ‘I spy with my little eye’ in a gallery setting. Drawn from the Redland Art Gallery Collection, Eye Spy encourages visitors to search for objects featured in artworks on display and in the process find out more about the Redlands. A perfect exhibition for the whole family to enjoy, with the opportunity to create their own games in the process. Curated by Simone Jones. 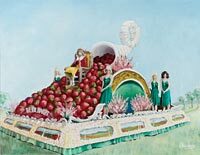 Image: Carol Williams, Strawberry Festival float (detail) 1979, oil on canvas board. Redland Art Gallery Collection. Acquired by Redland City Council prior to 2003. Courtesy of the artist.